One of my purchases was a short, boxy, black lace top. These days I am wearing longer shirts and I had no idea how to wear it, so I reached out to my trusty fashionista friend ERIN. She came up with 3 inspiration boards to give me some ideas. I am still SWOONING over her suggestions! After reviewing, I immediately added a fur coat and red skinny jeans to my "wish list." Which board is your favorite? 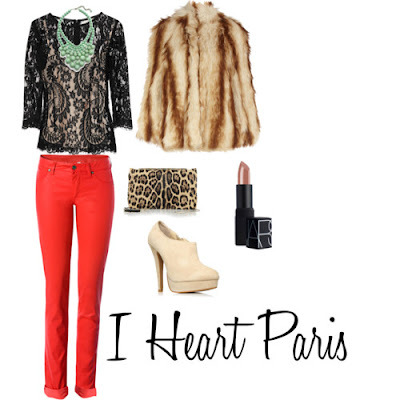 I am still trying to decide, but I think "I Heart Paris" is the most like me since I love incorporating bright colors into my wardrobe. Thank you ERIN for helping me plan out my weekend wardrobe :) Read Erin's blog, full of fashion, interior design, and amazing indie tunes HERE. WoW. She is GOOD. I'm drooling over the emerald earrings with that outfit on the Girly board. But don't forget to bring a warm coat, hat and gloves, because Paris is freezing! I am going to Emmaus (spelling?) later today to try and snag a 30 Euro FUR COAT haha... wish me luck!!! i LOVE the green emerald drop earrings. just wondering what the teachers and moms at daycare would say if i wore those every day!! And I get to see you model in Paris!!!! Omigosh...can't believe we're boarding the plane in less than 12 hours and I get to spend 2 weeks with my oldest daughter/dear friend!! XOXO!